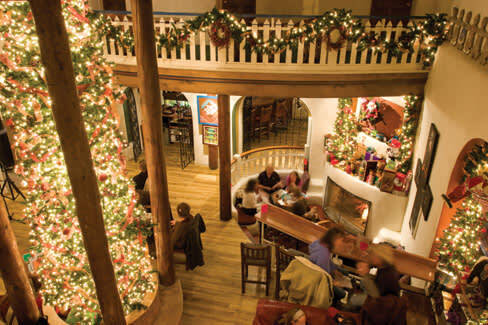 Bing Crosby may have crooned about the delights of being home for Christmas, but New Mexico’s inns and hotels offer cozy alternatives for special occasions—or perhaps just the right perch for a festive cocktail. Beginning Thanksgiving weekend, Carlsbad glows with Christmas on the Pecos, a river tour that delights passengers with views of more than 110 homes decorated with holiday lights and displays. The Trinity Hotel is also illuminated, beckoning visitors inside with gaslight candles set in each of its windows, period decorations that pay homage to the building’s 1892 beginnings. Tour passengers often stop in the Trinity’s restaurant for a pre-outing glass of wine and appetizers, and return after the excursion for dinner. The ornamented Trinity is also a focal point during Carlsbad MainStreet’s electric light parade, on November 30 at 7 p.m. (575-628-3768; carlsbadmainstreet.org). Stop in after this popular holiday event for a s’more latte from the espresso bar and a slice of Bourbon pecan pie for dessert. Owner Janie Balzano enjoys going overboard with the hotel’s interior décor as well. “I start planning the next year’s decorations the day after Christmas.” Guests of the hotel’s December wine dinner can enjoy the decorations, which are likely to include a 20-foot-tall tree and touches throughout the common areas and hallways. The one-seating-per-night dinner features six courses, each paired with a local wine from Balzano Vineyards—the hotel’s own label—and Luna Rossa. Check the website for the date and more details. It’s always sunny in Las Cruces, making it the perfect destination for an in-state warm-weather getaway. Even in December, guests can dive into the newly renovated pool area at Hotel Encanto de Las Cruces. Outside, guests can lounge on an upper terrace with a balustrade under 14 palm trees, soak in an above-ground Jacuzzi, or sip a margarita on the expanded patio at Azul Ultralounge and Nightclub. Inside, the hotel goes full throttle with traditional Christmas decorations, boasting more than 150 poinsettias, as well as garlands strung throughout the public areas and down the pedestrian avenida that leads from Azul past Garduño’s restaurant to the Spanish Colonial–style lobby. Guests and visitors can enjoy the property during the Christmas Day buffet, which runs from 10 a.m. to 3 p.m.
Hotel Encanto will also host a New Year’s Eve Bash expected to draw some 800 guests and sell out the hotel. Partygoers can mingle in the main ballroom, which will feature a live band playing pop and country music; in the smaller San Rafael Room, where couples can swing to big-band music; and in Azul, where Brandon “DJ Flipz” Cruz will remix hits for the twentysomethings. Tickets, $40 or $75 per couple, go on sale the first week of December, and include a complimentary glass of Champagne for a midnight toast to the promising year ahead. This month, the grounds and lobby at the Lodge Resort and Spa, in Cloudcroft, will be decked with Victorian-themed decorations in keeping with the history of the property, whose “new” building celebrated its 100th anniversary in 2011. Each year, a 20-foot tree is selected from the nearby forest and decorated with ornaments handmade by the Cloudcroft Art Society. “It’s so beautiful and heartwarming,” says the resort’s Chrystal Watters. “It’s like you stepped into ‘ ’Twas the Night Before Christmas.’” Fitting, since Santa and Mrs. Claus visit the Lodge on Christmas Eve to read the poem, while the hotel staff serves hot chocolate and cookies to guests and locals. (Santa also makes appearances at Sunday brunches at Rebecca’s, the hotel’s restaurant, throughout the month.) The enjoyment of the whole family is also kept uppermost in mind during the Lodge’s New Year’s Eve Gala, which includes concurrent adults’ and kids’ parties.